What happens when you are caught in between? Not one thing or the other, and only half of each? 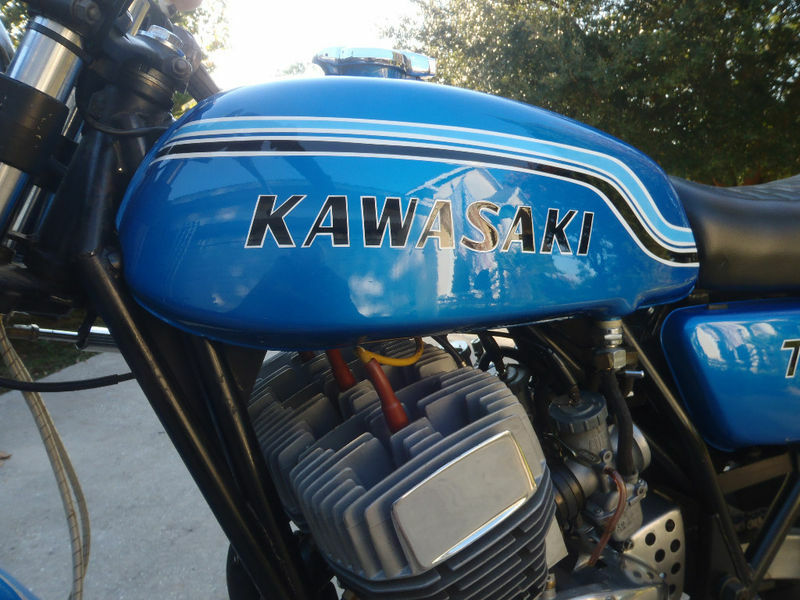 That is what it looks like this 1972 Kawasaki H2 offered on eBay now. 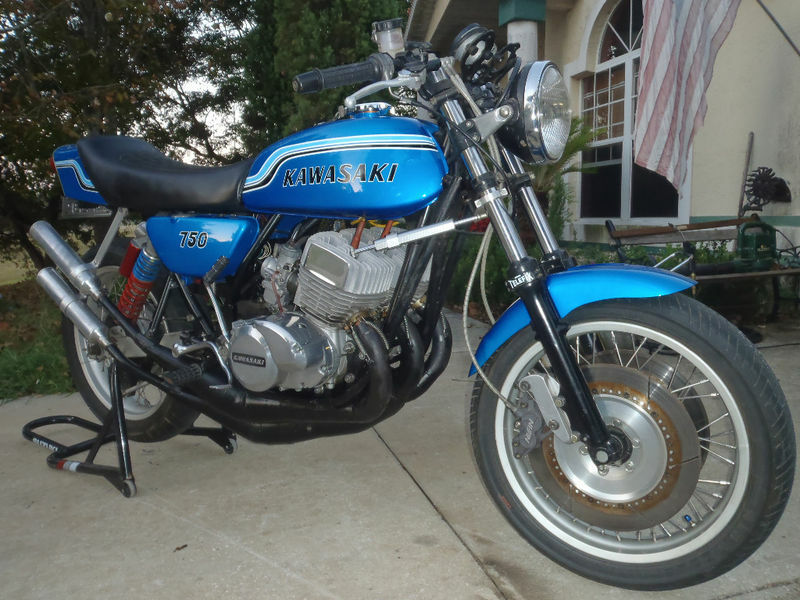 It started life in 1972 as a H2, but as the seller states, owning a bike for 24yrs, you change things up a little bit. 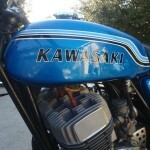 Now the bike is almost back to street trim, but not quite. 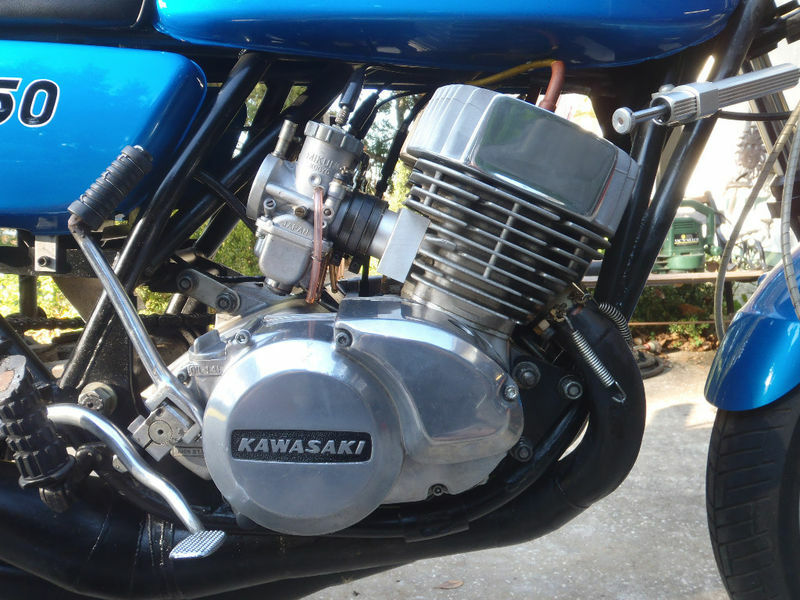 Kawasaki first offered a 3 cylinder 2-stroke in the form of the H1, with its 500cc. 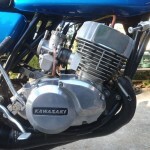 By 1972 they added displacement, and with that lots of power, and lots of trouble. Numbers like 74hp at 6800rpm and a 5 speed gear box would get you up to 120mph. The problem is that poor brakes, a frame not up to the power, caused terror in the rider when doing anything but going in a straight line. 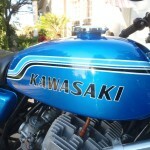 This bike likely would have taken care of most of the short comings if it had any success on the track. 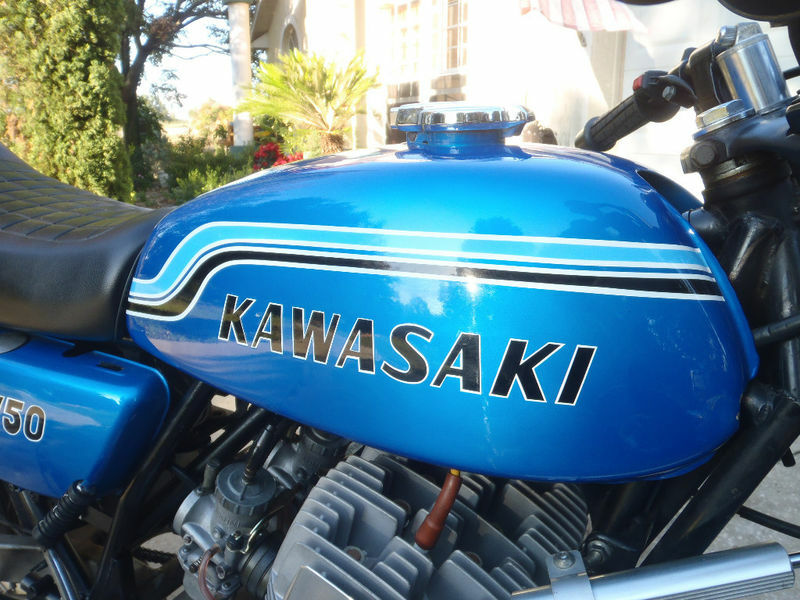 The frame was heavily modified at Yoshimura East inWest Milford,NJby the late Cal Duke. It has many mods, (Please see pictures). 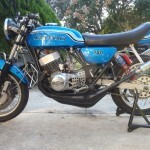 The rear shocks are layed down just like Wes Cooley’s last GS 1000 Superbike. 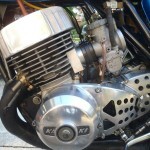 The frame has another set of front downtubes and also tubes that create a triangle under the tank. No flex. I added the box section swingarm which if fitted from a Suzuki GS 500 E. The rear shocks are Fox Piggyback Superbike Shocks. The Rear Sub Frame is made of Stainless steel and is very trick. There is also bracing above the swingarm pivot. 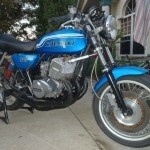 The front forks are of a 1982 GPZ 1100. They are 38mm and are fitted to bored out H2 triple clamps. 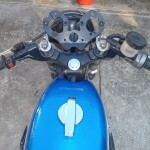 The top clamp was modified to fill in the holes for the handlebar mounts. 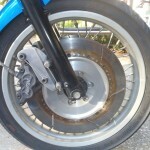 The front brakes are very trick Suzuki GSXR 750 4 Pistons calipers. They have Ferodo 2453 compound pads in them and are in very good shape. 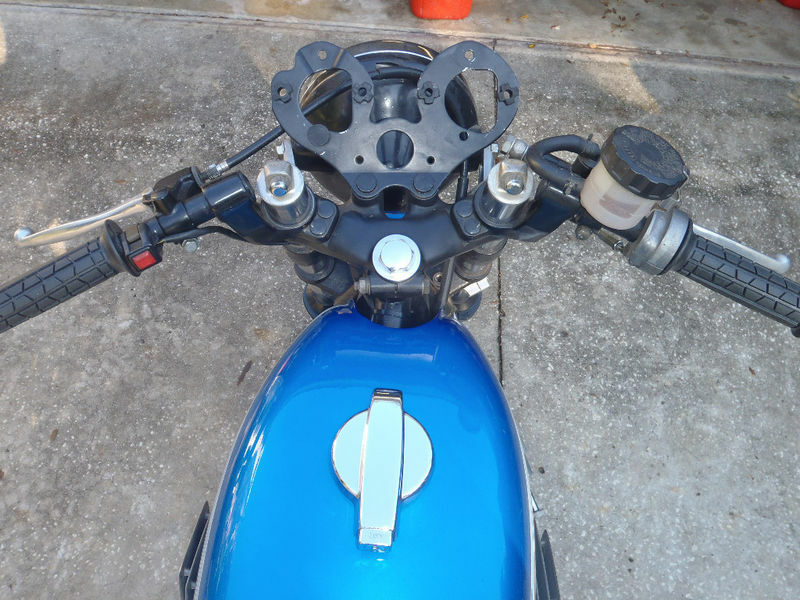 The master cylinder is off a Suzuki GSXR 750. There are steel braided brake lines. The rotor carriers and caliper mounts were built by Charles E. Sackett machine shop in Orlando, Fl. 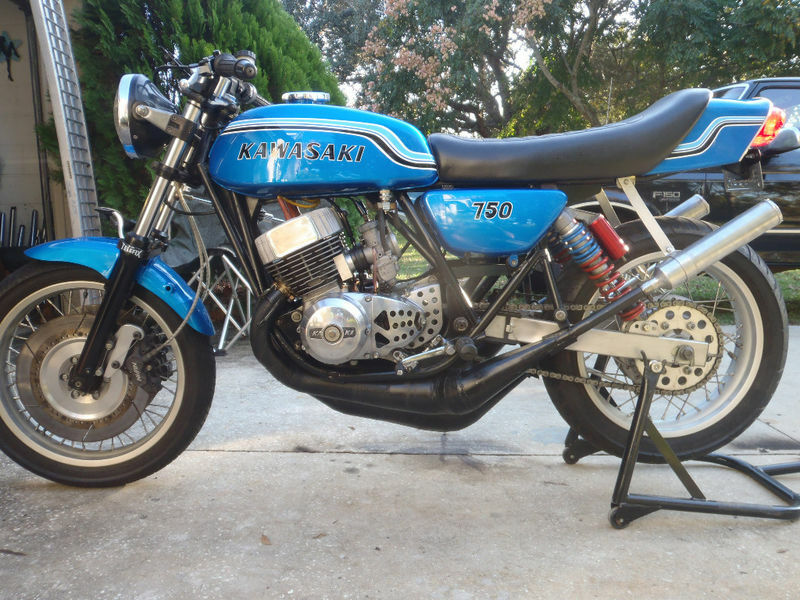 The rotors are the real deal Kawasaki KZ 1000 ELR S1, One of 29 ever built. 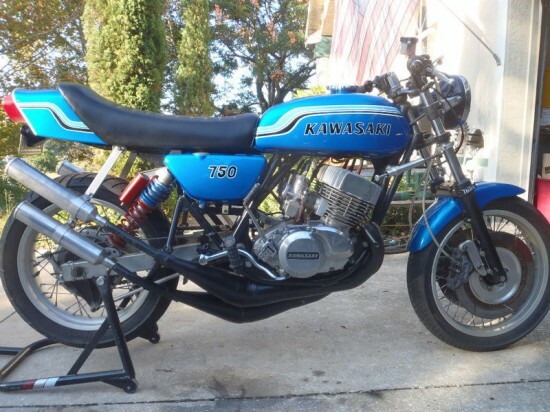 There is a lot of things going on with this bike. But it really is in between two places. 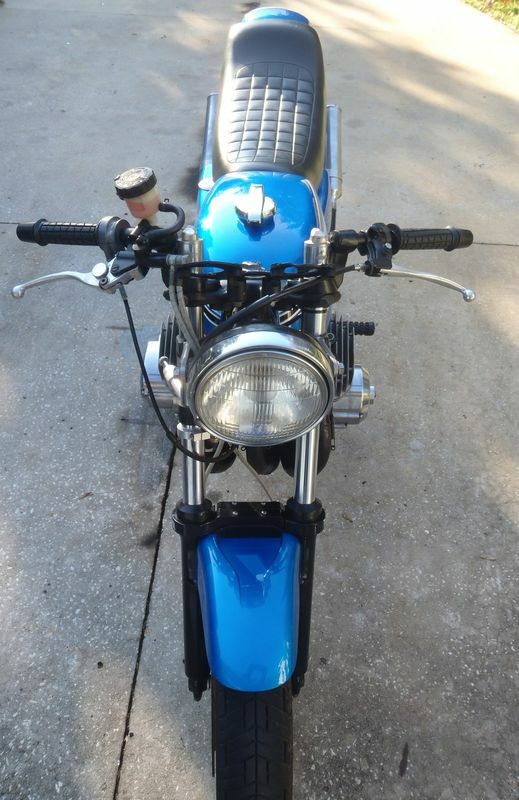 The seller is going to include a street wiring harness, but currently there is a total loss system on the bike. 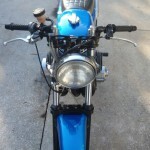 The headlight and tail light are on the bike, but no way to power them. 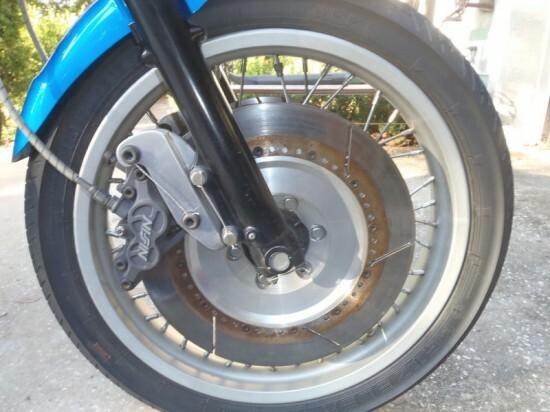 From the factory the bike would have been fed through 3 32mm Mikumi, the seller has upped the anti by adding 38mm round slide Mikumi’s. 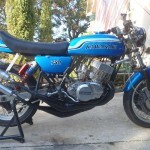 The seller shares a lot of details about the engine and the modifications made. 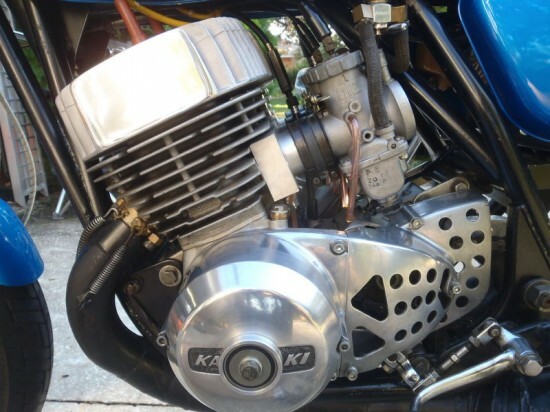 He says that he has never put the bike on the dyno, but thinks numbers would be above 100hp. He does have a clean title and pictures include the spare parts that will come with the bike.